One of my favorite neighborhood restaurants is Aala Wi. 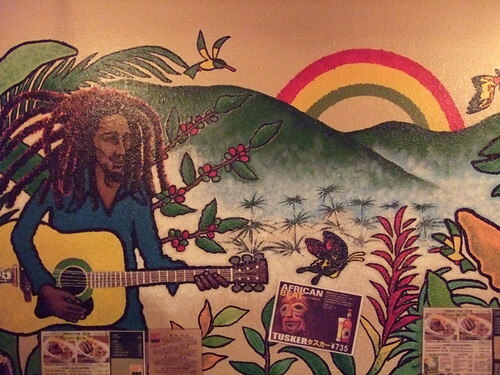 They serve Jamaican jerk chicken and pork. It’s on a little Ebisu street with a lot of posh, stylish restaurants and bars. In contrast, Aala Wi is very down to earth, casual and relaxing. And most importantly, cheap. None of the dishes are over 1,000 yen. When I first entered I felt like I had stepped into a little hippie café from back home. There are hand-written menus, flyers of music events tacked on the walls, and a hipsterish crowd with dreadlocks and bohemian clothes. The servers and cooks have a friendly, tree-sitting vibe. I could imagine them having an Earth First! meeting after closing. Their specialty is the jerk chicken, which comes with a bit of cole slaw and some banana chips. It’s not as spicy as I would like but you can pile on the chili sauce and ketchup. 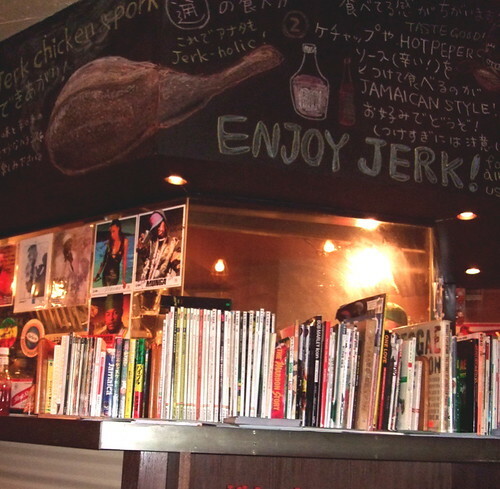 For vegetarians, they serve a jerk tofu, which is very tasty and has more vegetables than the jerk meat dishes. Keeping with the Jamaican theme, they serve a lot of rum drinks, but I always opt for the mango shake. They also provide take-out. In the background, there’s a constant stream of old school Jamaican music, reggae and dancehall, with a screen that flashes Caribbean music videos. During the week, it’s never crowded, except at lunch. And on the weekends, there’s a DJ who works the turntables. This is a great place to connect with Jah, while planning your next subversive act. Next Next post: Soccer or Football?